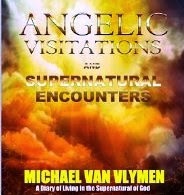 Angelic Visitations and Supernatural Encounters is a record of supernatural events taken from the journal accounts of Michael Van Vlymen, author of How to See in the Spirit. The goal of the author was to show that God's supernatural life is not just for a "chosen few", but for everyday, ordinary people as well. The record of events range from supernatural provision to healings to angelic visitations and more, experienced in normal, everyday living. The title for my review is a quote from Van Vlymen that meant a lot to me. It's true and profound. I really enjoyed this book. The author seeks to develop a relationship with the reader and it shows. The writing is transparent and accessible. He is honest and sincere which makes him credible. The teaching comes through his experiences which I appreciate. I love the courage that the author makes apparent by showing restraint. What I mean is that he doesn't make an effort to justify or rationalize his experiences. It's just, here it is. Take it or leave it. That's courageous. The testimonies are inspiring and for someone like me who is just at a place where all I want is for my life to look like God's life it reveals that there is so much more to His life than I've known. Great job. Certainly a great read.